We’ve previously discussed the increasing importance of using data to think about content creation and help producers figure out what will resonate with audiences, and today we want to dive a little deeper into one nuanced aspect: audience anticipation. Diesel’s Content Analytics tools were built to aggregate data from many sources including multiple social networks and video sharing sites, and examine all the engagement actions that audiences are taking online, to build a 360-degree picture of what people are excited about. 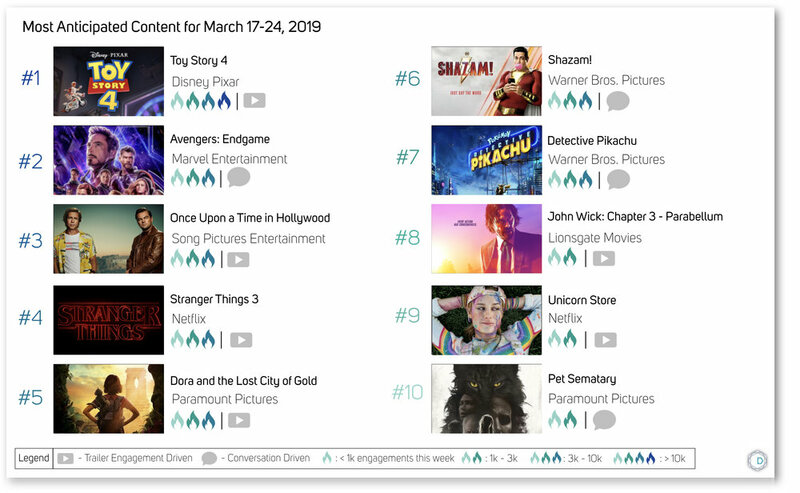 Today, we’re sharing a look at what pieces of content audiences were anticipating the most during the week of March 17-24. Notably, movies were a huge driver of engagement, which makes sense because studios are gearing up for summer movie season by dropping trailers for their upcoming blockbusters. Topping the list is Disney Pixar’s Toy Story 4, followed be Avengers: Endgame from Marvel. When it comes to shows (both linear and streaming), Netflix’s Stranger Things 3 has captured audience attention, followed by a reboot of The Twilight Zone from CBS. Video games are also high for audience anticipation, and although none made our top ten list this week, it’s worth calling out the top titles which include System Shock 3 from OtherSide Entertainment and Devolver Digital’s Katana ZERO. Update: We also looked at anticipation for March 25-31. Topping the list was Avengers: Endgame, the Borderlands 3 video game, and Child’s Play.